The Art Library presents a panorama of independent publications on art today. 'Kiosk' is a continually expanding archive of independent publishing in the field of modern art since the early 90s. It gives visitors the chance to look behind the scenes of the world of art: revealing the people, media and institutions responsible for documenting and proliferating the art process. The collection of the publisher and graphic designer, Christoph Keller, initiator of the 'Kiosk' project, currently holds over 6000 publications (including artists' books, catalogues, periodicals, videos and audio recordings) from diverse project partners. The publications trace the economic strategies of publishers, editors and artists who define the objectives and direction of successful trends in graphic design and fashion today. 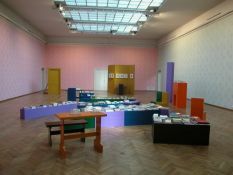 The exhibition celebrates the acquisition of the collection in 2007 and the subsequent handing over of the project to the Art Library where it will be continued until 2010.